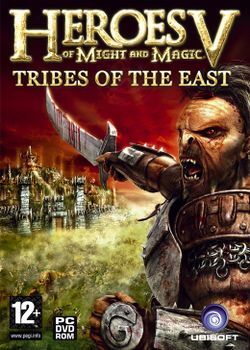 Heroes of Might and Magic V: Tribes of the East is the second expansion pack to Heroes of Might and Magic V and the first stand-alone expansion pack released for the fifth series. It was developed by Nival Interactive and was released by Ubisoft Entertainment on October 12, 2007 in Europe, then soon after in the U.S. on October 18, and then Russia on October 25. Poland later received a release on January 24, 2008. The story begins with the character Quroq, an Orc, who takes over a renegade Haven city and begins to introduce worry upon the false Queen Isabel. The queen sends forth her most trusted servant, the corrupted Archbishop Alaric to ward off the Orc invasion. The actual events that happen between this and the next time we see the Orcs are unknown though Quroq is killed by Alaric at some point. This page was last edited on 28 October 2016, at 03:40.